War is a terrible thing. With brutal indiscrimination it carves up victims and separates survivors. Those that live through it can often teach us more than any historian ever could. With art and prose, some even do it in a way that transcends. Paul Nash was one such individual: an English WWI soldier, official war artist, and poet. With his words and paintbrush he revealed the battlefield for what it really was, both during and after the Great War. As one of the most influential and important artists of his era, a graphic novel recounting his life and delving into his fractured psyche is a more than fitting tribute. Acclaimed illustrator David McKean draws the story for us in the rich alternating styles of Nash, doing the old artist proud and then some. The result is Black Dog, named after the visitant canine that plagued Nash’s dreams and visions from his childhood to his post-war years. Neither malevolent nor benign, this specter skulked in his periphery through sickness and in health, war and peace. It acted as an omen, messenger, foe, and friend. The writing in Black Dog is sparse, and while largely effective, it isn’t the focus of this work. A picture paints a thousand words, but under the influence of Nash, McKean’s creations have the ability to double, even triple that. There are several different surrealist styles in play, and the shifting artwork reminded me often of the Hellraiser graphic novels, a series renowned for its incongruously frightening art and stories (which McKean himself actually contributed to at one point). But where Hellraiser reveled in abstract fantastical horror, Black Dog wallows in our earth-borne war-torn nightmares and sleepwalks through the dreams dredged from such. This book has the ability to build a sense of wonder in the reader, but also shock and awe. For instance, the incredible two-page illustration of a German zeppelin over London imagined as a massive airborne coelancanth-type creature will stick with you for days. It’s hard to be critical of a work based on a celebrated artist, writer, and soldier. Thankfully, blessedly little misses its mark in Black Dog. There are times, far and few between, where the poetry strains at its weakest links or the prose can come off heavy-handed. As a record of one man’s life experience there is an absence of pretentiousness, but the writing can still seem didactic in places. Whenever this occurs it isn’t long before a striking or breathtaking piece of art balances the book back out. Surrealism is a tricky thing, and isn’t for everyone. But in the context of the stressed and strained mind of a surviving solider coming to terms with the warfare he witnessed, it is a near perfect fit. Damaged souls can give a commanding voice to both beautiful and harrowing stories. 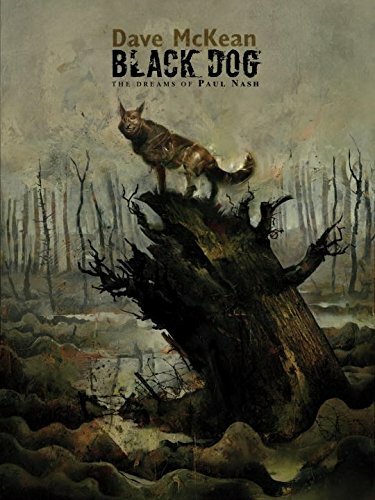 Paul Nash is the embodiment of it and Dave McKean harnesses his power, channeling it into a superior graphic novel that everyone should experience. J. Kent Messum's award winning-debut novel is Bait (Plume). His most recent novel is Husk (Penguin UK).